We will be performing website maintenance September 26-27. Web services may be intermittent. This unprecedented national series of conferences was designed to help U.S. businesses expand sales, penetrate new markets, and boost their bottom line through exports. 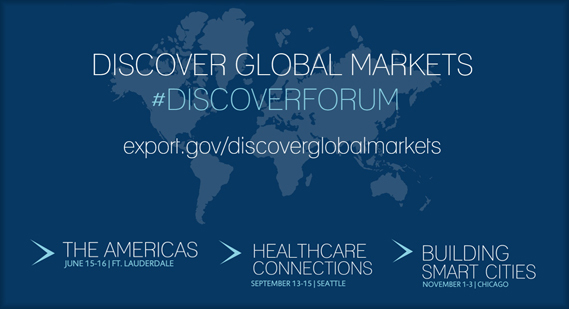 Reserve your spot now at a Discover Global Markets event in 2016. Quickly find everything you need to know about doing business overseas, with in-depth information on exporting to 123 countries. 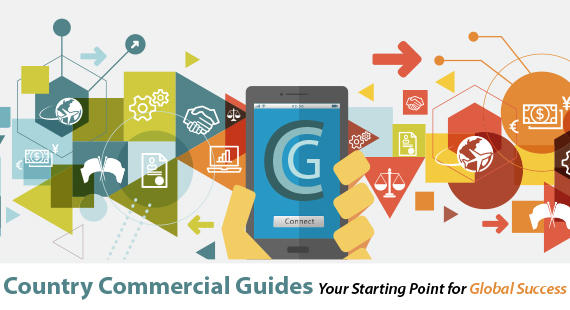 Updated and easy to navigate, the Country Commercial Guides are your starting point on the road to global success. 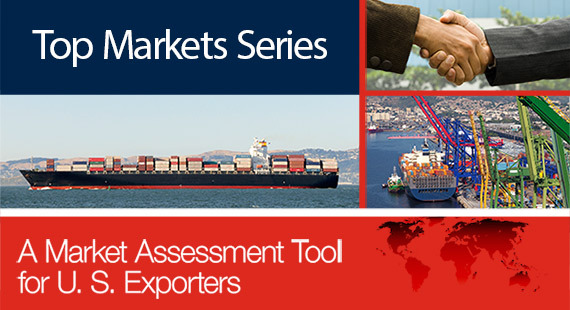 The top markets report series is a useful tool to help exporters compare opportunities across borders. Find updated reports for 2016! In the past this expo featured over 400 franchise exhibitors, with investments ranging from $5,000.00 to over $1 million and a wide range of product categories. Join IFE in New York City, in June 2016. Fancy Food Show is North America's largest specialty food & beverage event. Register now to join us in June in New York. Outdoor Retailer Summer Market is one of the world's largest outdoor gear and apparel shows. Join this show in Salt Lake City, August 3rd to 6th. The Singapore International Water Week Expo (SIWW) is Asia's well-established business-to-business event for all aspects of the water industry. Held from July 10-14, 2016. The Farnborough International Airshow (FIA) is a global showcase for the aerospace industry with a reputation that attracts a vast international audience. Join us in the UK for this show in July. SET Expo is the premier business and technology event for broadcast and new media in Latin America. Join this show in São Paulo, from August 29-September 1. Under Secretary Selig will lead a delegation of U.S. renewable energy companies for a series of meetings with government officials, power sector decision makers, potential buyers, and other commercial partners in Mexico. May 16-20, take part in the Safety and Security Trade Mission to Honduras, Guatemala, and El Salvador. Join Trade Winds Latin America to explore markets in Latin America – Chile, Peru, Bolivia, Paraguay, Uruguay, Mexico & Argentina. This show runs from August 29th - September 1st. If you seek to diversify your student body, increase enrollment and want more information about how to connect with students from Mexico and Brazil, join this webinar on July 28th. Join us on September 14th for this webinar which will introduce exporters to the world of Cargo Insurance; learn what is important to know to make the right decisions and why it is a critical issue when negotiating price with a buyer. This webinar will introduce exporters to the world of letters of credit and important issues to understand in order to use them effectively. Register to join us on October 12th. The U.S. Government has also strategically partnered with major corporations to help small and medium-sized U.S. companies begin and/or expand their export sales.